Although the venue has changed, the Mujeres de Maíz throw down beginning this Sunday, March 7th is moving forward full tilt. In honor of International Women’s Day and in alliance with the series of month-long events to raise awareness and help healing happen in our communities here and across the border under the banner of “A Prayer for Juárez,” the firme sisters and compañeras and guerrilleras in the struggle for peace and justice bring “13 Baktun: Return of the Wisdom of the Elders.” The event marks the 13th year since the birth of the Mujeres de Maiz movimiento. Filmmaker Maritza Alvarez informed me several months back that the MdM collective was actually begun in Boyle Heights, so it is only fitting that the 13th anniversary is celebrated ontierra sagrada, ground zero for Chican@ and Latin@ culture in LA. The 13th letter of the alphabet is “M,” so I feel perfectly justified saying that in year 13, and forevermore the letter “M” will commemorate, for me, three very important terms that begin with “M,” Mujer, Madre and Maíz. A whole slate of programs, performaces, pláticas, panels, women’s self-defense workshops and more will be held at several venues on the East Side in honor of Wombyn’s Herstory Month. The kick-off alone features an afternoon of free performances at the Mariachi Plaza Metro stop. Las Ramonas, In Lak Ech and Raquel Salinas are all part of the bill. Sunday will also feature an art exhibition at Primera Taza a half a block east of the Metro stop performance program. The evening portion of the Sunday launch moves to Salones Casa Grande on César Chávez (Brooklyn Ave.), a historic ballroom on the second floor just east of Mott St. La Santa Cecilia will perform with Afro-Peruvian cantautora Susana Baca, alone worth the price of admission. Mujer Mercado will be occupy the Salón before hand from 5 p.m. to 9 p.m. Hope to see you there. Please visitwww.mujeresdemaiz.net for specific dates, times and locations. We’re particularly proud that the MdM have chosen Corazón del Pueblo for a MdM Core Members/Co-founders panel discussion on March 14th and for an MdM Poetry Night on Wednesday, March 18th. 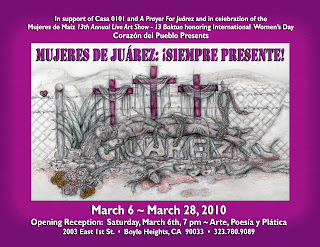 All of this follows the inaugural Saturday, March 6th opening of three complete Boyle Heights arts district exhibitions dedicated to the women of Juárez and an end to the violence that has claimed the lives of more than 400 young women. Corazón del Pueblo will open an exhibition entitled “Mujeres de Juárez: ¡Siempre Presente! The show includes work by over 21 artists from LA to Texas, among them artists such as Grace Barraza-Vega, José Lozano, Joe Bravo, Anna Alvarado, Lalo Alcaraz, Arturo Urista, Emilia García and Mary Nuñez Delira, just to name a few. Luís J. Rodríguez, Gloria Alvarez, Olivia Chumacero and Felicia Montes will share poetry beginning at 8 p.m. Victoria Delgadillo, who works out of Self-Help Graphics is curating a separate exhibition that will be installed at both Casa 0101 and the Casa 0101 Annex. Please check www.aprayerforjuarez.org for a list of the artists and poets participating in the Casa shows. Image above: Juárez, Mary Nuñez Delira, 2010, prisma pencil on paper.